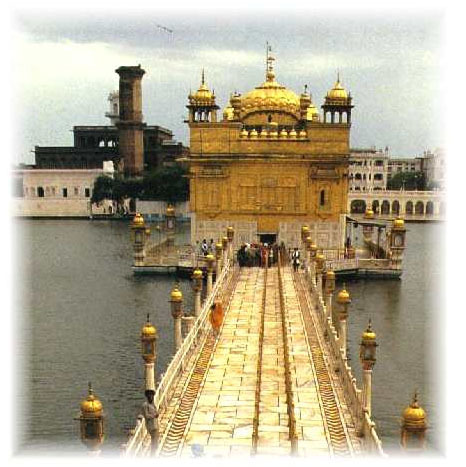 This, the most sacred of Sikh temples, is situated in Amritswar in the northwestern state of the Punjab. 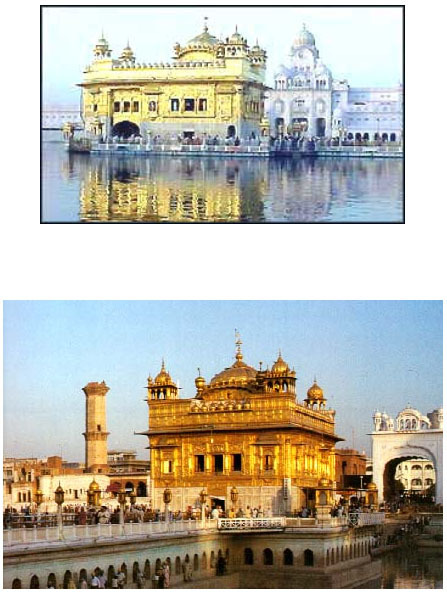 It is also known as the Harmandir (mandir for temple and Har for God), and every devout Sikh yearns to visit this temple at least once during his or her life. 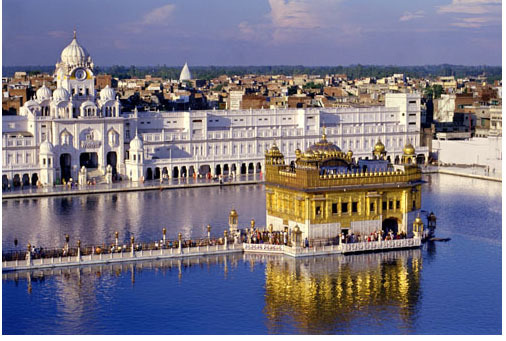 It is constructed of white marble in the lower part and gilded copper in the upper reaches and the domes. While the design of the building has borrowed heavily from both Muslim and Hindu architecture, there are some intentional departures. For example, the building is at a lower level than the causeway (in contrast to the Hindu temples) so that the steps lead you down to the main structure. This is thought to signify the inner grandeur of the religion rather than the exterior appearance. Likewise, the building has four doors, one on each side of the roughly cubical structure. This is thought to imply that all four castes of Hindus are welcome. The idea of building such a temple came from Siri Guru Arjan Derji; however, the present grandeur of the structure evolved over time and with repeated destruction (by Muslim invaders) and reconstruction. The greatest contribution to its construction and beautification came during the reign of Maharaja Ranjit Singh (AD 1799-1839) and much has been added to the exterior and the interior by devotees over time. The devout Sikh is expected to contribute up to 10% of his/her income as well as to volunteer labor (“serve”) to the improvement of this most important edifice of their faith. They also take "ceremonial baths" in the lake surrounding the temple, to cleanse their souls.